A slightly unusual title for a blog you might think. 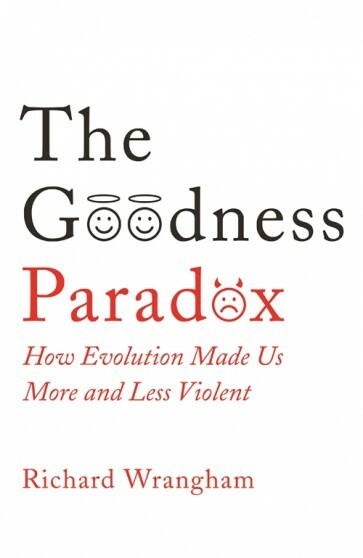 I went last night to the Royal Institution to listen to Richard Wrangham talking about his new book The Goodness Paradox. I won’t even try to summarise the very rich lecture, which covered swathes of evolutionary thinking as well as graphic detail on the brutality of chimps. Richard draws a basic distinction between two types of violence: proactive (premeditated, calculated) and reactive (spontaneous, sudden). His basic thesis is that as humans we differ from other animals in being much less inclined to exhibit the latter. Apparently we do only a thousandth of the ‘scuffling’ that chimps and even the more peaceful bonobos engage in. Chimps, by the way, are an example – though a rare one – of animals that also engage in premeditated violence, bands of them setting out purposively to inflict serious damage on other chimps. Richard’s broad historical sweep included a description of how our skulls have changed since the emergence of homo sapiens. The shape of the skull is key to human development, making room for our huge brains (well, it’s all relative….). So the rounding out of the skull, and the shortening of the face, are key human features. What really grabbed my attention was the revelation of gender convergence in the shape of skulls. The convergence is of males toward females; in other words as we became more ‘human’ the skulls of men changed shape to become more like those of women. The key term is ‘cranial feminisation’. Now one of the primary conclusions of the Paula Principle is that we will not resolve the underutilisation of women’s competences until there is a far greater degree of what I called ‘reverse convergence’. So far the general trend has been convergence by women onto the male pattern of work – from entering paid employment, then working full-time and continuously, seeking careers and moving into occupations previously occupied by men. There has been very limited movement in the reverse direction: men working part-time or, more significantly, with discontinuous careers, Those who do have generally been less qualified and less ‘successful’, at least in conventional terms. Recent news of the tiny proportion of men working in early years education is just further confirmation of the one-way nature of convergence. Of course there is a huge gap between the vast evolutionary timescales that Richard Wrangham is talking about and the contemporary labour market context of the PP. But I found the notion of cranial feminisation fascinating, and one that might give reverse convergence a useful boost. It’s nice to be able to draw on evidence from long-run evolutionary science to support the notion that a degree of feminisation helps us up the scale of human development, whether that is to do with peacefulness or fulfilment at work. Overall, I have to say, it seems to me that the questions of whether or not humans are less violent than chimps or bonobos, and whether human violence has declined over the past centuries, as Stephen Pinker argues, are important, but less challenging than the massive difference in the infliction of violence by men and women. Whether it is proactive or reactive, men are responsible for maybe 98% of all violence (my guess only), and that’s the real challenge.